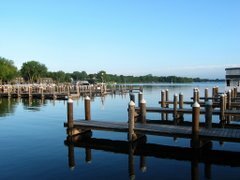 Lake Minnetonka Association: Decontamination, gates and fees, oh my! Decontamination, gates and fees, oh my! There is now a gate installed at the Christmas Lake access. Carver County Parks has approved a plan and recommended funding for mandatory inspections for all boats entering Lake Minnewashta. This plan calls for turning boats away or requiring them to be decontaminated should they fail the inspection. Other area lake associations, such as Lotus Lake, Fish Lake, Medicine Lake, are arguing for similar protections. Too much? No. Not if we are serious about protecting our lakes. Unfortunately (for Lake Minnetonka), a zebra mussel infestation in Lake Minnetonka seems to have been a wake up call for others. For the sake of other lakes, we sincerely hope it is not too late. For the sake of Lake Minnetonka, let’s pay attention because we remain exposed to quagga mussel, spiny waterflea, hydrilla, etc. Why is this happening? Simply, the state’s rules and authorities are not adequate and nearby lake association are rightfully concerned their lake will be next. The state bureaucracy is not as nimble as aquatic invasive species (AIS) and therefore the state response has been too slow. As well, AIS pose a huge challenge on many levels and there are competing and conflicting interests. In addition, the state’s AIS protection system has evolved piecemeal and lawmakers have approached the AIS crisis too timidly. We must now either play catch up or bear the consequences. The Department of Natural Resources (DNR) is encouraging more efforts from local partners. However, they want consistency throughout the state, which is reasonable. Unfortunately, guidelines for local authorities that could provide this consistency are not at hand. This is creating great frustration. Encouraging local initiatives and partnerships on one hand, yet not allowing them to become unshackled from the inadequate protective state overlay on the other hand is a formula for frustration. It is also a formula for failure. In a newspaper article, a DNR official is quoted as saying, “the DNR is studying whether it can delegate inspection authority to cities, counties or watershed districts, and is working on a "package" of changes that will be announced next spring.” If we wait for this, we will have lost another year. Again, more frustration. Underlying all of this is the inability to reconcile the state’s long-standing tradition of allowing open access to lakes with the ability of AIS to exploit this open access. This must be confronted and reconciled if we are to be serious about protecting lakes. The Lake Minnetonka Association believes Lake Minnetonka and all Minnesota lakes are public resources that should be available for all to use and enjoy. We also believe that aggressive protection measures, such as those mentioned above, can be implemented in an equitable manner to better protect the lake without unreasonably affecting public access. In the meantime, we remain exposed. We sometimes hear that the state constitution prohibits this kind of aggressive protection. I have asked both of my state legislators to provide an assessment of this question so we are all starting on the same page, but as of yet no answer. Until we learn otherwise, I think we should proceed in a manner that is more protective of our lakes. The Minnehaha Creek Watershed District is proposing to amend its management plan along these lines. The Lake Minnetonka Association supports this. What next? We applaud these local initiatives and encourage their implementation. The Lake Minnetonka Association urges the local agencies responsible for protecting Lake Minnetonka to be similarly bold. Lacking this, Lake Minnetonka remains exposed to new and more AIS. could assume you're an expert on this subject. Well with your permission allow me to grab your feed to keep up to date with forthcoming post. Thanks a million and please carry on the enjoyable work.